Does your backyard lack pizzazz? Do you long for a more lavish outdoor living space but cannot afford the cost of a makeover? Decorating your backyard, garden or patio doesn’t have to break your budget. There are numerous inexpensive outdoor items you can purchase that will instantly add life to your yard. By thinking outside the box, you can transform your backyard into a welcoming, low-cost showpiece. Before you begin mentally sketching out your lush outdoor retreat, consider where you will do most of your shopping. Many stores that carry outdoor decorations may not fit into your backyard budget. However, there are numerous places where you can maximize your spending and walk away with some unique treasures. The key to finding any décor is to keep your own interests and personality in mind. One of the most well-kept secrets in the outdoor design world is the dollar store. While many items on the shelves may be less than chic, there is an abundance of basic elements every homeowner needs. You can find garden stakes, flower pots, flower bed borders and even wind chimes at most dollar stores. Spend some time strolling up and down each aisle, and if an item catches your eye, grab it. You can always find a use for each purchase later. If you appreciate secondhand merchandise, consider shopping at yard sales, flea markets or thrift stores. Your tastes may seem unique to you, but you may be surprised at how many people have exactly what you need. You can also play treasure hunt in your own garage, shed or basement to find hidden gems. Repurpose antique buckets by turning them into planters or refresh those old, wooden lawn chairs with a new coat of paint. The cheapest way to transform your yard is to use your imagination. Searching for the small details that make a backyard special is the easy part when it comes to outdoor decorating. It’s the larger pieces that often flatten the wallet. Many people go overboard by making unnecessary purchases. 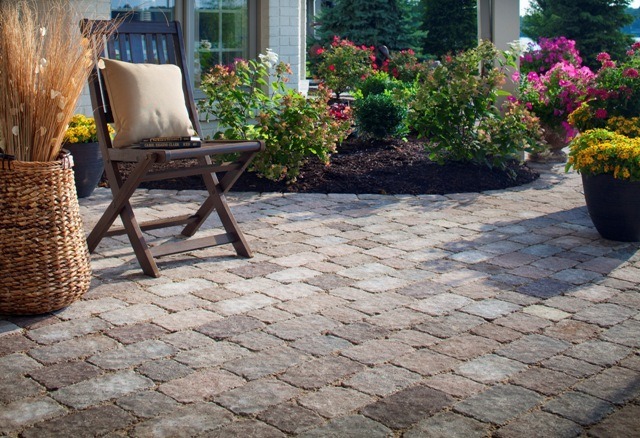 In order to ensure you are getting only what you need, consider how you utilize your yard. If your backyard is your own private oasis, you don’t need a dozen chairs or a dining area. Place two to four colorfully cushioned plastic chairs around a bold umbrella table. Use a small, metal fire pit to replicate the more expensive brick or clay alternatives. Hang strands of twinkling holiday lights in place of costly lanterns. Lay a large outdoor rug to create a special dining area. Spruce up old indoor/outdoor carpeting by painting a unique design on it. Use stain to transform a timeworn deck. The best way to keep your finances in check while shopping for outdoor furniture or larger items like grills or fire pits is to buy at the end of the season. Many garden centers and home improvement stores have holiday or pre-season sales as well. You can also apply for credit cards at certain stores and receive discounts on many outdoor items. When looking for any large design elements, it’s best to shop around rather than buy on impulse. Your outdoor decorating scheme should reflect your style and complement your indoor designs. Bring your indoor colors outside by placing coordinating pillows on chairs or benches. Create a hanging basket by using inexpensive pottery and some plants or flowers from inside your home. You can also purchase low-cost blooms in flats and place them on patio pavers as a border. Buy flats at the end of spring for less. A truly unique and cost-effective method of turning your backyard into a conversation piece is to attract wildlife to the area. Hang bird feeders from various trees, and place a hummingbird feeder near windows so you can view from indoors as well. You can also build brush or rock piles to attract small critters such as rabbits, frogs and chipmunks. Entertaining in your own yard should be a positive experience for everyone. With a little innovative thinking, you can transform your backyard into an eye-catching wonderland while preserving those important family funds. Install It Direct can help you with your decorating needs. Sign up for a free estimate or join our mailing list for more tips on how to update your outdoor living space on a budget.